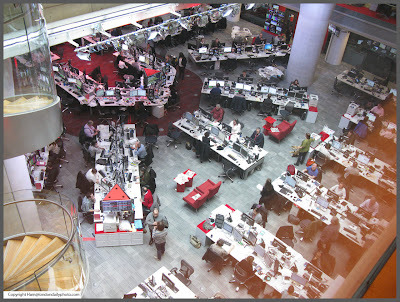 A couple of days ago I was privileged to visit the new BBC centre. It's a fantastic building, but you are told to keep moving because you never know if you are on camera. Comments on "Inside an Institution"
At first glance I thought this was the library at the LSE (coincidentally across Aldwych from the old BBC HQ). I always loved this view entering the building. And I'd wager the BBC doesn't have any penguins on the grounds.